Daedalus wrote: I wish I wish I had a fish. Granted. It was caught, ingested and barfed up by a SF sea serpent weeks ago before it ended up on your plate. I wish I knew how do deal with Mafiosi. nmblum wrote: I wish I had some control over my uncontrollable wish. Granted. You will lose all control and "go for it" with a vengeance - in public. And you'll be haunted by news crews from that day forward and forced to talk about your secret wish in front of cameras for weeks. I wish my bills were paid. I wish I didn't relish being haunted by news crew so much, and regret that I CAN keep a secret.
" Norma, you poor sad lonely alcoholic. You entire life is devoted to interrupting other people's posts on this forum, regardless of the topic, to tell them what's wrong with them. The irony is, here you are doing it again, with this very post. Your fanciful card games, movie sojourns and exciting overseas trips, that all take place within the four walls of an aged care retirement home, do not suggest your own children offered you the care, I gave my parents." scrmbldggs wrote: I wish I knew how do deal with Mafiosi. Granted. You end up being indicted on charges related to your dealings with the mafia. You are talked into testifying against them and put under the witness protection program where they move you out into the middle of Nebraska. I wish today was Sunday. My Coca Cola comercial moment came outside of a restaurant in Waco. I was wearing No.33, which I always did, but this was before puberty, so probably didn't smell too bad. When a large black man approached me and handed me a flyer of some kind. He scribbled on it, and said, " Here you go, kid", and walked to his car. I treasured that autograph, but it's long gone. Moving around as much as we did. I was even running back in 7th and 8th grade, but lost interest by high school. I was one of the fastest sprinters in my platoon in the Army. I'd win sometimes, tie, or come in second, and few times third. Not NFL fast, not close to that, but I was pretty quick. When I was a kid, I sprinted all the time. I was going to be Tony Dorsett when I grew up. fromthehills wrote: I wish today was Sunday. Granted, but your new work schedule is Sunday-Thursday so you just lost a day of your weekend. I wish we hadn't forgotten about this game for so long. It's not off -topic at all. Because we can't really play games with people who don't have the same cultural references as we do. Just as it's hard to tell jokes, or use humorous allusions. It doesn't work…no bond of mutual comprehension and experience can be formed. No light of recognition goes on. But now that I know who Tony Dorsett is (or was, and what the reference meant to you) my own response is different, more empathetic. Your wish now has meaning AND the humor of ruefulness. And I can sympathize with you that Tony Dorsett's autograph got lost in all the moving around. Granted. But we all forget all of the other threads. Permanently. I wish my budget didn't exceed my income. If you keep your mind sufficiently open, people will throw all manner of garbage into it. But with one teensy-tiny micro proviso: you MUST revise your budget pronto.. as in now. It's easy and I am here to help you. First work on cutting out the inessentials, meaning food, and then then get to the luxuries like toilet tissue,toothpaste, and of course that killer of thrift, soap. And need I remind you that no one with legs really NEEDS a car with its incessant demands for fuel? And of course, there's electricity: a relatively new invention and already we are in thrall to it… dip a cudgel in paraffin and ignite it and see what great light it will give off. You can either read by it, or for amusement (TV isn't good for you anyway) you can burn a cross on your neighbor lawn. Edison and the utility companies cry your eyes out. Easy as baking a cake without flour, sugar, milk or eggs. I wish Ang had a lot of leisure time , wonderful health, and money enough to enjoy what her terrific instincts have taught her. Granted. Ang gets hit by a bus, and has plenty leisure time to learn how to control that chair with a straw. Money from the City Bus settlement, and healthcare 24/7. I wish I'd studied more when it counted. fromthehills wrote: I wish I'd studied more when it counted. Granted. You now know how to crochet doilies in record time. I wish I knew what "irrational timelessness" is. Granted. Your the only one that does, though. Good luck explaining it. I wish I had better planet puns. fromthehills wrote: Granted. Your the only one that does, though. Good luck explaining it. Granted. Sadly, though, they only get shared in your orbituary. I wish I knew where the time goes. OlegTheBatty wrote: I wish I knew where the time goes. Granted. You're invited to tag along and... I shall miss you. I wish I had a big fat burger and some fries. I wish I was a big fat burger. 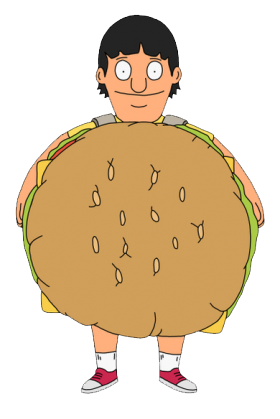 You are, indeed, a big, fat burger with all your senses of touch and pain intact. You get consumed slowly by NMB but, as burgers to not have mouths or throats, no one can hear your silent screams as Norma very slowly and thoroughly chews your big, fat flesh. I wish the post below this one didn't corrupt this wish. When Religion becomes State, and breaking the Law becomes a Sin, then Dissenters will become Heretics. But the second one finds you in an attack of anxiety that renders you in front of a shrink, that just nods and says," Tell me more about the wish game then." And " Nevermind, heres a prescription for 20,000 mg of diazepam. Make it 40,000." I wish I knew why I wanted to be a burger? Granted, it's because you want to be just like Gene Belcher. I wish it hadn't taken us this long to get the thread kicked back into motion. Granted. We didn't take long at all to get this going again. It's just that the future came up on us far faster than expected. I wish, even though pot is legal, that the whole damn town didn't smell like it. fromthehills wrote: But the second one finds you in an attack of anxiety that renders you in front of a shrink, that just nods and says," Tell me more about the wish game then." And " Nevermind, heres a prescription for 20,000 mg of diazepam. Make it 40,000." Your wish cannot be granted, because the wish was based on a misspelling and most certainly no real desire to be nothing more than a piece of meat. Clearly what you wanted to be was a Burgher. Oh, how I wish I had a wish! Granted. Two trucks overloaded with manure collide and explode in the center of town. I wish the past was more predictable, so people would stop asking me what the hell I just did. OlegTheBatty wrote: Granted. Two trucks overloaded with manure collide and explode in the center of town. No living, breathing human is ever going to question you directly again: you will stay here forever, (or until implosion), exchanging mere words and hopeless wishes with disembodied "others." Last edited by nmblum88 on Mon Oct 13, 2014 4:41 pm, edited 1 time in total. Granted. The vacuum I was going to offer to Woostone descents in your neck of the woods instead. I wish I had some bacon. scrmbldggs wrote: I wish I had some bacon. Granted. You are attacked by a large squirrel. When the redneck sheriff arrives to shoot it, he declares, "My, that's some bacon!" I wish the coffee didn't taste like muddy water run through lawn mower trimmings. Gord wrote: I wish the coffee didn't taste like muddy water run through lawn mower trimmings. Granted. It now tastes like muddy water run through lawn mower trimmings digested and expelled by bovinae. I wish I had a pumpkin bread. scrmbldggs wrote: I wish I had a pumpkin bread. Granted. Your head is now a pumpkin bread. I wish it was nap time. Granted. Your lap time is 8 minutes 49 seconds, which is really rough on a burro. I wish time would take itself, a bit more. fromthehills wrote: I wish time would take itself, a bit more. Granted. Time now takes so much time, there's hardly any left for anyone else. I wish my stomach could handle that third piece of pumpkin pie as well as it did ten years ago. Granted. The increased surface area allows plenty of space for a third piece to make its own splatter mark. I wish I didn't have to choose between going to bed, or going out to the cooler to get one more beer. fromthehills wrote: I wish I didn't have to choose between going to bed, or going out to the cooler to get one more beer. Granted. You fall asleep in the cooler. I wish I could stay up longer, but I'm so tired. Gord wrote: I wish I could stay up longer, but I'm so tired. Granted. You're standing up but that mop leaning against the wall that you're snuggling up against is full of allergens and your head swells up to the size of a large pumpkin. I wish my neighbors would pick up after their dogs. Granted. The neighbors jump into the pick up and chase the dogs all over the neighborhood at 5 in the morning. I wish I was still sleeping. No need to grant an unreasonable wish. You will sleep enough (unable to complain) when you are dead. Use the waking time wisely, usefully, helpfully: join an internet forum, and post messages about your insomnia. Remember that the Protestant Ethic discourages wasting one's time. Oh how I wish I were a more empathetic , kinder, more lovable person. Last edited by nmblum88 on Tue Oct 14, 2014 1:43 pm, edited 1 time in total. Even a "Let's Pretend'" friend would be remiss to grant you a wish that would only make you unhappy when you find your waist unattractively expanded: flab is whack. Cut out bread altogether and come back in a month for a review of your case. I wish I really cared what you wish for. Granted. You are now followed around by hordes of miserable people seeking understanding, terrorists, pedants, luddites, and even right wing radio talk show hosts. Because I have had the luck to be followed around by miserable people seeking understanding, pedants, and even right wing radio talk show hosts. I don't mind luddites, because there is something to be said for less technology…and more using of the postoffice. And one mother's terrorist is another mother's freedom fighter. I wish I were less of a skeptic (as in skeptical ). nmblum wrote: I wish I were less of a skeptic (as in skeptical ). Granted, whether you believe it or not. I wish I could find a cheap hat that fits my head. I wish I didn't have to choose between the Mercedes and the Bentley. And not granted, necessarily on your behalf, but because *I* don't believe that a man can be considered a real man without a well fitting hat that gives a hint of his discriminating, independent taste… and courage , i.e." no guts, no glory .."I* LIKE it." I wish i knew such a man.